The U.S. Equal Employment Opportunity Commission issued a Final Rule increasing the maximum penalty for violation of posting requirements relating to Title VII and other employment-related laws. The agency cited inflation as the reason for increasing the maximum penalty from $210 to $525. Penalties will still be assessed on a per-violation basis. The final rule is effective 30 days after publication in the Federal Register. Employers should use this as an opportunity to check all postings for compliance. 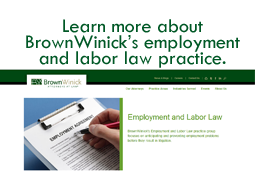 If you have questions, please contact a member of the BrownWinick Employment Law Practice Group.